A critical vulnerability has been discovered in the most popular plugin of the WordPress content management platform (CMS) that puts tens of Millions of websites at risks of being hacked by the attackers. The vulnerability actually resides in most versions of a WordPress plugin known as ‘WordPress SEO by Yoast,’ which has more than 14 Million downloads according to Yoast website, making it one of the most popular plugins of WordPress for easily optimizing websites for search engines i.e Search engine optimization (SEO). The vulnerability in WordPress SEO by Yoast has been discovered by Ryan Dewhurst, developer of the WordPress vulnerability scanner ‘WPScan’. All the versions prior to 1.7.3.3 of ‘WordPress SEO by Yoast’ are vulnerable to Blind SQL Injection web application flaw, according to an advisory published today. SQL injection (SQLi) vulnerabilities are ranked as critical one because it could cause a database breach and lead to confidential information leakage. Basically in SQLi attack, an attacker inserts a malformed SQL query into an application via client-side input. However, in this scenario, an outside hacker can’t trigger this vulnerability itself because the flaw actually resides in the 'admin/class-bulk-editor-list-table.php' file, which is authorized to be accessed by WordPress Admin, Editor or Author privileged users only. Therefore, in order to successfully exploit this vulnerability, it is required to trigger the exploit from authorized users only. This can be achieved with the help of social engineering, where an attacker can trick authorized user to click on a specially crafted payload exploitable URL. If the authorized WordPress user falls victim to the attack, this could allow the exploit to execute arbitrary SQL queries on the victim WordPress web site, Ryan explained to security blogger Graham Cluley. 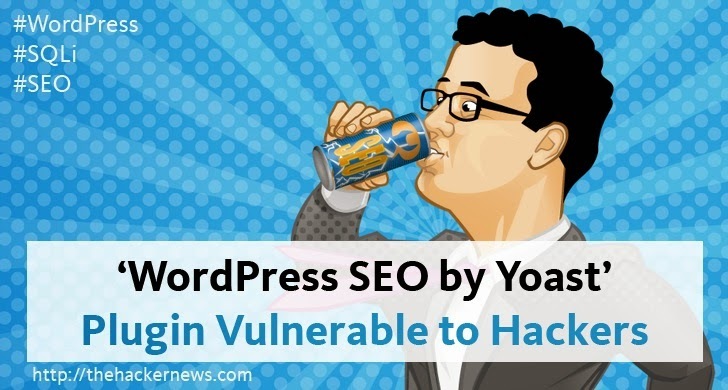 However, the vulnerability has reportedly been patched in the latest version of WordPress SEO by Yoast (1.7.4) by Yoast WordPress plugin developers, and change log mentions that latest version has "fixed possible CSRF and blind SQL injection vulnerabilities in bulk editor." Generally, it has been believed that if you have not installed WordPress Yoast for SEO, then your WordPress website is seriously incomplete. The vulnerability is really serious for website owners who wish to increase their search engine traffic by using this plugin. Therefore, WordPress administrators with disabled Auto-update feature are recommended to upgrade their WordPress SEO by Yoast plugin as soon as possible or they can manually download the latest version from WordPress plugin repository. If you have installed WordPress 3.7 version and above, then you can enable fully automate updating of your plugins and themes from Manage > Plugins & Themes > Auto Updates tab.